Lyon Eats: Found: Dr Pepper! Spotted with much joy at Intermarché in Rochetaillée-sur-Saône! 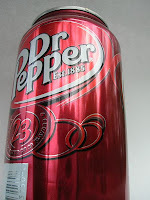 Individual cans of Dr Pepper at 99 centimes each. They were in the international aisle, wedged between Old EL Paso salsa and Oreos. can anyone confirm that Dr Pepper is available at other Intermarché locations? Holy Cow, 99 centimes! Dr. Pepper cost 2.60 at Best Bagels near Terreaux. I bought a can from City Bagels (off rue de la République) for 1.80 euros. But Intermarché is the first grocery store I know that carries it.